Dark Matter Institute is unlocked after the first Black Hole and it allows players to purchase new technologies for Dark Matter. Unlike most upgrades, the technologies in Dark Matter Institute are permanent and are not lost in planetary attacks or upon entering a Black Hole. 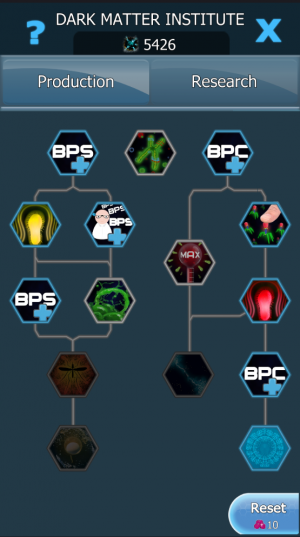 The Institute has two tech trees. Purchasing an upgrade from one tree does not lock you out from the other tree. Resetting one tech tree costs 10 and returns the spent Dark Matter back to the player. There is no limit to how many times a tech tree can be reset and the price for each reset does not increase. 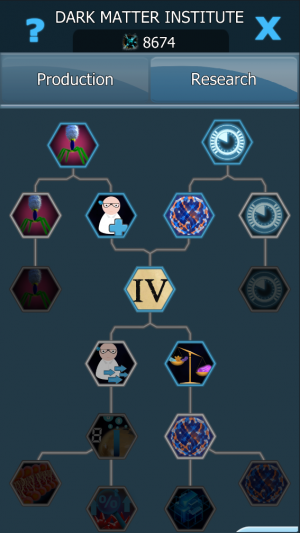 If the player has purchased Doppelganger, it's impossible to reset the Research tree if there are no idle scientists. This page was last edited on 6 February 2019, at 16:04.